You are here: Home / Blog / The Mountaineers Pacific Crest Trail Challenge! The Mountaineers Pacific Crest Trail Challenge! 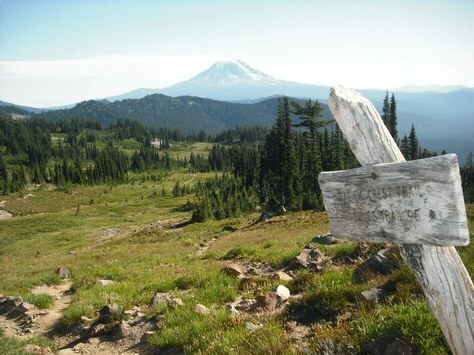 Join your fellow Mountaineers in a season-long celebration of the Pacific Crest Trail. Volunteer hike and backpack leaders are needed to lead trips on the trail. The Pacific Crest Trail (or PCT), a 2663.5-mile National Scenic Trail stretching from Mexico to Canada through California, Oregon, and Washington, epitomizes the ideal of physical challenge and one-of-a-kind natural resources bringing people together for a purpose larger than themselves - much like the mission of The Mountaineers. The 2016 Mountaineers Pacific Crest Trail Challenge is designed to celebrate and focus the attention of our members on the trail – not only to help our members to experience it on foot, but also to encourage their engagement in the wide circle of cooperation that sustains it. We encourage you to participate in the challenge by volunteering your time to help maintain the PCT, to advocate for it, to assist others to complete their PCT dreams large and small. A season-long program of Mountaineers-led day-hikes and backpacks on the PCT, and coordinated tracking of PCT miles completed, with badges for various mileage milestones and prizes for those who complete the most miles (plus extra rewards for those who lead!) – think PCT-related merchandise like caps, shirts, mugs, jackets, books and maps. Coordination of PCT service activities, from trail maintenance to ‘trail-angel’ activities, and celebration of exceptional service efforts. Events, speakers and films through the season to celebrate and educate people about the PCT and the amazing people and places associated with it. To join the PCT Challenge as a participant, and take part in the mileage tracking, special activities and events, register here (a small fee to helps cover events and prizes). Members from all our branches are welcome. Contact the course leader Denise Crafton at buffmtwoman@yahoo.com. We're excited for you to join us in our celebration of the trail, the ideal, and the people who protect and maintain it.